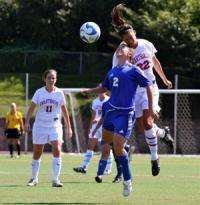 (PhysOrg.com) -- A recent study, published in the October edition of the Journal of Applied Statistics, looked at soccer as being an experiment to determine which of two teams is superior, but their analysis found a high statistical probability that the best team might not win. The study, carried out by Gerald Skinner and Guy Freeman from the University of Maryland, used a Bayesian approach to analyze the soccer games in various types of competitions, including the 2006 World Cup. The analysis of the scores of the 2006 World Cup games found that intransitive triplets occurred in 17% of the 355 triplets, which is not much better than the expected random result of 25%. The initial stages basically represent repeated experiments and should produce a more reliable result, according to the study's authors, but the knockout rounds played by the 16 winning teams are not like repeated experiments, and therefore the results are not reliable. The analysis found that in 2006 the best team had only a 28% chance of winning. The study suggests that a level of confidence could not be obtained unless the game was changed radically, but the idea the authors propose, of having the game continue in extra time until the goal difference is large enough to yield an adequate level of confidence is not workable. Fans of the 'beautiful game' may also actually like the idea of not knowing for certain which team was going to win anyway. That's exactly right: soccer is really exciting to watch also because the outcome is more random, more than many other sports like baseball or NFL football. I can't believe you have this point of view and still call it soccer... isn't that some sort of cardinal sin? Any footer fan will say this is blindingly obvious. Players often get injured, coaches experiment, refs can make bad calls, the lads can have a night out before the game, monte zumas revenge, ... the list goes on. Clearly these sporadic events can influence the outcome. Score is a poor metric of a quality. I would want to see more frequent metrics like possession time, shots on goal, passing success. I think this article is a case of bad statistics. I use to be a leader of a boys group. During game time I often placed all the best players on one team and all the poor players on the other. It always amazed me how the poor players kept up with and often beat the better players. What I observed was that the good players tended to play as an individual, while the poor players kept passing the ball to other team members. I also coached a first grade basketball team (perfect season) our goal was that everyone would get a basket during the season and purposly told the better players to pass the ball to weaker players to achieve this. The other teams couldnt figure this out. They knew who the better players were and guarded them, but our good players passed to weaker players and they scored. I think poorer teams can beat better teams if they play as a team. in typical american fashion, the article was illustrated with a photo of women football. While it's true that "minnows" often have the opportunity to knock off the elite squads from time to time, over the long run quality, especially quality of depth, will allow the better teams to rise to the top year after year. The English Premiere League is a prime example as the "Big Four"--Arsenal, Manchester United, Liverpool, and Chelsea--routinely vie for the premiere league's championship. However, in response to the interesting study, the FA Cup, an all-league tournament open to the smallest teams as well as the top leagues, includes many exciting and unforeseen upsets that make every game a potential, "for-all-time" event that local fans will recall for decades. That's one reason why I love to watch whatever games are broadcast in the States.